Diane Lane is an American film actress. Born and raised in New York City, Lane made her screen debut in George Roy Hill’s 1979 film A Little Romance, starring opposite Sir Laurence Olivier. 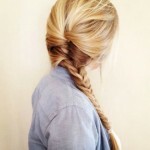 She loves to wear shoulder length hairstyles, and here is another style from her. This easy-care cut is great for thick hair and perfect for keeping cool and chic in high summer temperatures! The shoulder-brushing length is a great way to change from long hair to a more youthful length that can take years off your look. Diane’s hair is cut into long layers with a graduated line creating shorter lengths to frame the face. The hair is styled off the forehead with attractive height created by natural waves either side of the blurred off-center parting. Diane’s thick hair has plenty of natural volume at the sides and is styled to display her whole face. The lightly flicked up ends are very flattering giving a carefree, casual touch that is beautifully accentuated by the subtle caramel highlights!